The vocal writing of Cyrano owes something to Debussy’s Pelléas et Mélisande, in Julian Budden's assessment. It's not a resemblance that I had noted in previous listenings, so different are the moods and settings of the works, but there are audible similarities between Mélisande's balcony scene and Roxane's. 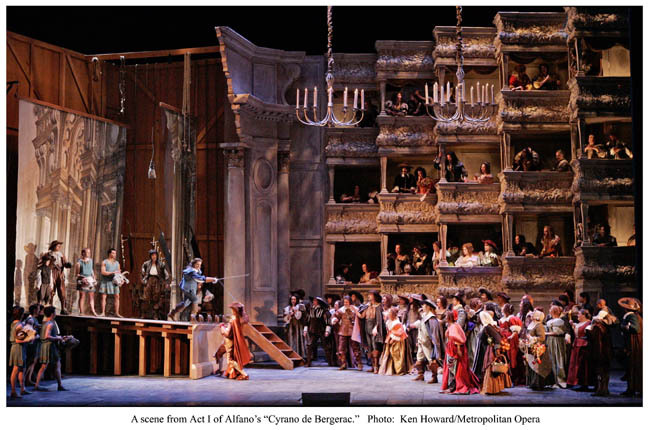 Throughout, Alfano's music makes the melancholy underlying even Cyrano's most triumphant moments inescapable. The great Act I set piece at the theatre is characterized by dissonances that are unresolved, by long, yearning phrases, and by the voice of Cyrano, whether as poet or as fighter, set against those of all others on stage. It is telling that much of Cyrano's great personal manifesto, in Act II, is entirely unaccompanied, as are his moments of greatest frankness -- of ecstasy and anguish -- in the balcony scene. Roberto Alagna has made the central role his own; but the work offers other highlights as well. The "Voici les cadets de Gascogne, de Carbon de Castel-Jaloux!" is stirring and should make a great moment for the Met's superb men's chorus. In many ways, it seems to me, Alfano's comparatively neglected work is a good use of the Met's resources. It's an interesting score, seldom performed, and therefore of interest to opera obsessives. At the same time, it's unapologetically romantic, and thus likely to be attractive to devotees of nineteenth-century opera's greatest hits. Having a star of Alagna's magnitude and the rising soprano Jennifer Rowley perform alongside each other is the kind of decision I wish the Met would make more often. I won't be able to see this run, but I hope you'll tell me if you do, Gentle Readers. Adorno’s final major essay on gramophony, Opera and the Long-Playing Record, published in Der Spiegel in 1970, places the gramophone as the 'optimal' presentation of opera, providing 'a concentration on music as the true object of opera. LPs provide the opportunity -- more perfectly than the supposedly live performances -- to recreate without disturbance the temporal dimension essential to operas. Shorn of phony hoopla, the LP simultaneously frees itself from the capriciousness of fake opera festivals.' He says 'recordings awaken to a second life in the wondrous dialogue with the lonely and perceptive listeners, hibernating for purposes unknown'.... This 'théorique immersion' implies gramophony as re-presentation of an ideal scene — one in which the 'force and intensity that had been worn threadbare in the opera house' was recaptured, and the preclusion of optical stimuli, that he proclaimed 'must be subordinated to the primacy of music,' was guaranteed.